A quilt is a treasured family heirloom, one that many people would love to possess. They are lovingly quilted by hand and hung in our home or laid over a bed. They are beautiful works of art. Another beautiful work of art is a barn quilt. Barn quilts are made of wood, not fabric. Many resemble fabric and those are some of the loveliest. 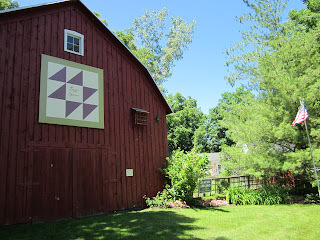 A barn quilt is a large piece of wood that is painted to look like a quilt block. 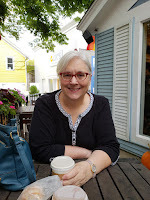 Saturday, April 30th and Sunday, May 1st as part of their "Spring Into the Past" museum tour, the Tri-River Historical Museum Network will be kicking off a new quilt trail: "A Stitch in Time" Quilt Trail. 43 barns, building and posts are adorned with barn quilt squares in a four county area of western Michigan. Each barn quilt is a unique piece of public art. They feature sunflowers, spinning spools, stars, flowers, leaves, geometric shapes, animals and more. The weather in Michigan is improving and now is the time to take a road trip to see these unique quilt squares. Just remember they are on private property and you need to be courteous to the owners and view them from the street or road.